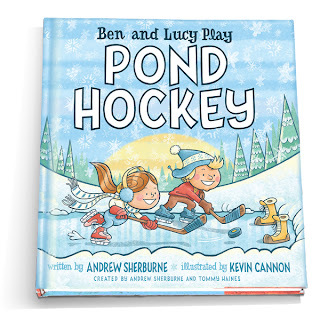 Author Andrew Sherburne sent me a copy of his new children's book Ben and Lucy Play Pond Hockey. Illustrated wonderfully by Kevin Cannon, this is a charming book that should be in every kid's library. The story is about a brother and sister enjoying a great day of skating and playing hockey on frozen pond. With their boots acting as nets and the friendly animals of the forest acting as fans, Ben and Lucy and their friends play nicely together and have a lot fun. The writing is fun and easy. New readers will enjoy the rhyming verse, while those who are still a little too young will love having this book read to them as they explore the illustrations. The author was very smart to include both a boy and a girl as the lead characters, allowing boys and girls to enjoy the book equally. The illustrations and the colours really steal the show. They offer a level of interactivity that you hope for in such books. Kids eyes will sparkle as they explore the forests to find all of the animals, or trace the fun hockey action on the pond, or maybe even daydream of their own great day of outdoor hockey followed by hot cocoa! I highly recommend this book to anyone with young kids in their lives. But don't take my word for it. The book is nicely endorsed on the back cover by the noted Sports Illustrated writer E.M. Swift, Team Canada captain Hayley Wickenheiser, former NHLers Tom Kurvers and Bret Hedican and Olympic figure skating gold medalist Kristi Yamaguchi. 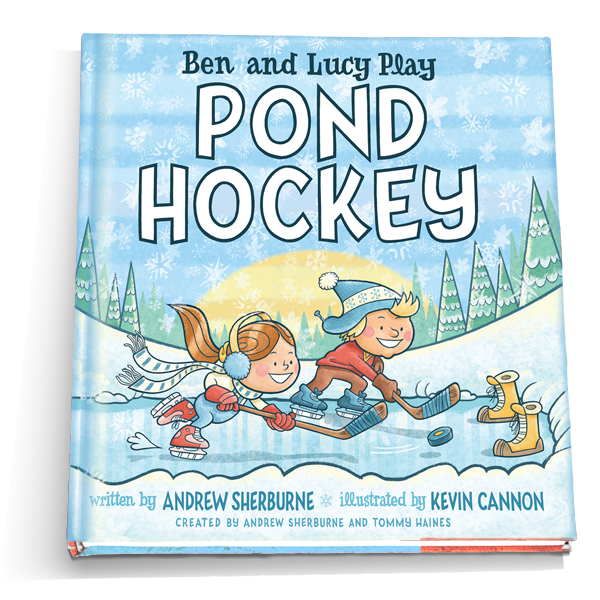 By the way, author Andrew Sherburne and co-creator Tommy Haines are also behind the 2008 DVD release Pond Hockey which features Wayne Gretzky, Sidney Crosby, Patrick Kane and others.